"After having some personal experience with life and activities of the Women's Divisions in the RCAF or Wrens, " noted Clark in a letter to the director of the National Gallery of Canada, "I lost all hope to see 'any drama' there. But I found exciting enough the fact that in some of the activities, women performed the jobs, previously done by men and thus, released (perhaps) some men for fighting duties or for war industries." 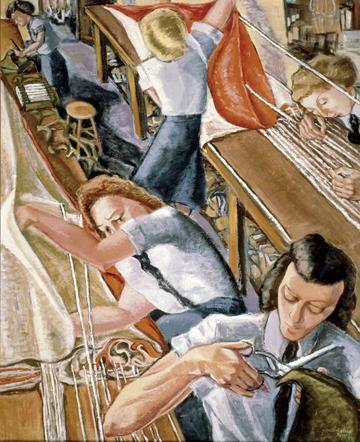 In this painting, the intense expression on three of the women's faces draws attention to their tasks of cutting, folding, and securing the lines of the parachutes they are making. Two diagonal workbenches dramatically split the composition into three parallel bands in which their figures and arm movements create a dynamic zigzag across the surface.